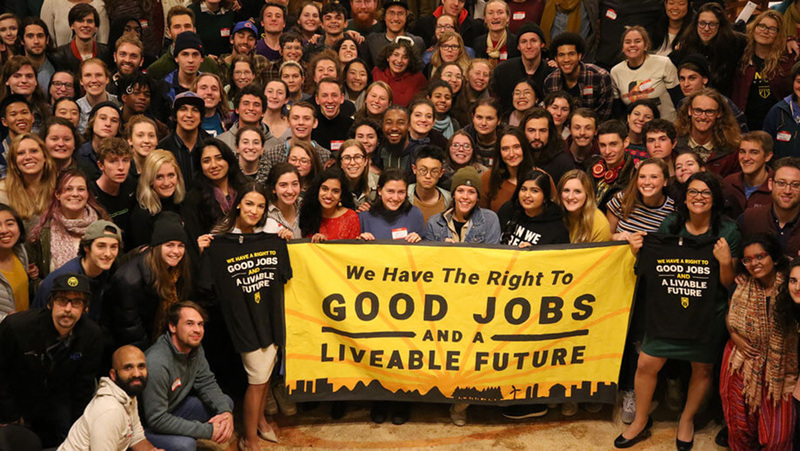 To avert a climate catastrophe, members of the Sunrise Movement are pushing to pass the Green New Deal, a bold plan to get our country off dirty energy within the next decade. With more than a hundred local chapters across the country, the Sunrise Movement is making climate change an urgent priority. The world’s leading scientists warn we have 12 years to tackle the climate crisis or risk a global catastrophe. We’re in a fight for survival, says Varshini Prakash, a co-founder of the Sunrise Movement. Varshini Prakash is a co-founder of the Sunrise Movement. Prakash is helping mobilize tens of thousands of people to support a Green New Deal, a far-reaching policy proposal that seeks to transform our economy and society at the scale needed to stop the climate crisis. Earthjustice is proud to endorse the Green New Deal resolution and stands in solidarity with Sunrise's efforts, which will help our country get to zero-emissions and 100 percent clean energy — and fast. In this interview, Prakash talks about the enthusiasm behind the Green New Deal, taking on the billion-dollar fossil fuel industry, and why the cost question over the deal is utterly misguided. 1. What’s the vision behind the Green New Deal? With the Green New Deal, what we’re really talking about is a socio-economic program that’s set to rival one of the greatest projects in American history. The New Deal passed by President Franklin Delano Roosevelt put millions of people back to work and helped elevate working people and poor people following the Great Depression. The Green New Deal is a program that works to stop the climate crisis but also seeks to eliminate poverty in America and create tens of millions of high-paying jobs for Americans. 2. How was Sunrise able to spark such enthusiasm for the Green New Deal? This is the first time we’re considering a policy and program that actually gets to the scale and magnitude of the crisis as has been laid out by climate scientists. It’s also the first time in American history that a politician, Rep. Alexandria Ocasio-Cortez (NY-14), is freely championing a position in society that can stop the climate crisis with racial and economic justice at its core. 3. How do the Green New Deal and original New Deal compare? The way they’re similar is largely around the size of the project. We’re not talking about a singular policy, like a carbon tax. We’re talking about an umbrella of policies over decades that would move our country to a 100 percent renewable energy economy. The Green New Deal also ties to the vision that was set 100 years ago in the original New Deal. It was a vision of American democracy where all people can have a dignified life and access to a job, healthcare benefits, a home, etc. These are basic human rights. 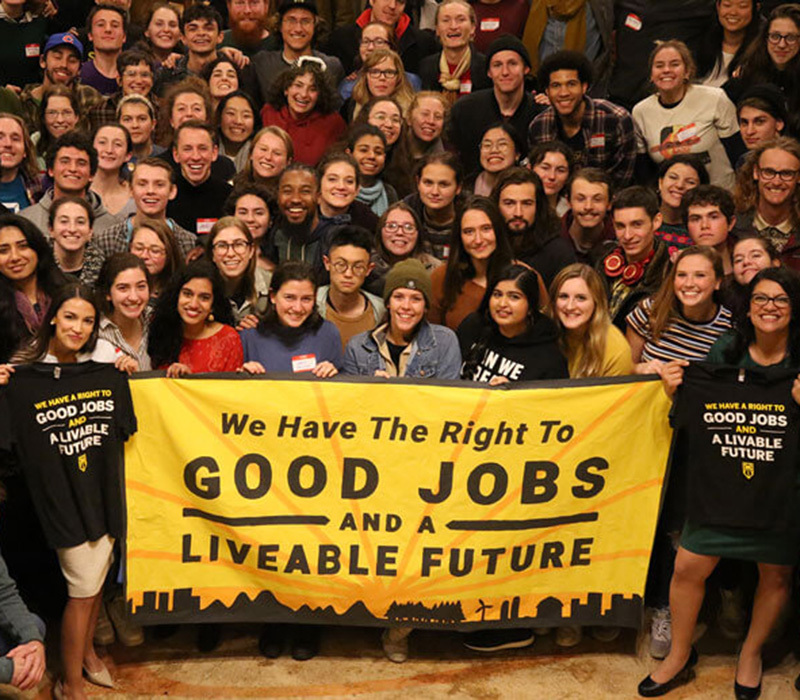 What’s different is that we’re working to ensure the Green New Deal doesn’t leave behind low-income communities and communities of color in economic prosperity. Particularly frontline communities who have seen the extraction and impact of the fossil fuel industry for decades are the people we want to see benefit the most from a Green New Deal. We also want to ensure workers aren’t left behind by pushing for training and support in the clean energy transition. 4. How do we pay for the Green New Deal? First, I’d like to ground us in what we’re talking about here. Scientists have said we have 12 years to rapidly transition every aspect of our economy and society to quite literally protect human civilization as we know it and avert global catastrophe. I don’t really understand how the biggest question that comes after that can be, how do we pay for it? This is about survival. This is about existence. And I can’t think of anything more valuable and important than saving millions of people’s lives. The cost question is also utterly misguided. If we’re going to talk about costs, let’s talk about the cost of doing nothing. The hurricanes are going to get bigger, the wildfires are going to get stronger and last longer. We know climate change will increase the spread of more viruses and life-threatening diseases. There is just so much out there that we can guard against if we take action now. In 2017, the U.S. had the largest costs on record for weather and climate disasters. It’s only going to get worse. The costs of inaction far outweigh the costs of doing something. Imagine a vibrant America powered by 100% clean energy. Earthjustice is driving that vision forward. Our attorneys connect hard-hitting legal strategies with deep-seated expertise in the energy sector, breaking down legal barriers to clean power. Support Earthjustice's legal work — we represent all our clients free of charge — and be among the first to experience the special climate issue of our magazine. 5. What kind of jobs will the Green New Deal create? We’re going to push for updating our outdated infrastructure, electrifying our grid and public transportation, and increasing energy efficiency, so we’ll be creating jobs in all those sectors. There will also be jobs like wetland restoration and land conservation, and jobs that involve planting trees to capture carbon from the air. But we’ll also be creating jobs in education and the care economy. We will need care for people who have gone through climate disasters and support people who have to relocate because their home is threatened by climate change. There will be jobs educating people about the climate crisis and what they can do to help. This is a massive investment project that’s going to be creating tens of millions of good jobs, putting money in people’s pockets so they can live more dignified and peaceful lives. 6. What gives you hope you can succeed? We’ve seen tens of thousands of people join us through online and offline actions and we’ve seen hundreds of grassroots groups who I never thought I’d be seeing at a table together getting excited about mobilizing for a Green New Deal. I’m 25. I haven’t been around for that long, but I’ve seen a kind of energy that I’ve never seen before. People are just ready to back solutions that they believe will actually solve the greatest existential crisis of our generation. They’re seeing the way the Green New Deal can tackle so much at once. Economic inequality, underemployment and unemployment, the climate crisis, racial inequality, and gender inequality. All these issues continue to be a blemish on American society. 7. What can Earthjustice supporters do to spur bold climate action? Get involved. We need every person who is worried about the climate crisis, and who is pissed off about fossil fuel billionaires who have utterly corrupted our democracy and bought out one political party and part of another party to do their bidding. We are not going to win unless we have millions of people who are vocally active and pushing for a Green New Deal in the streets and in our communities to ensure that it becomes a political inevitability in this country. We’re building an army of people to combat the climate crisis, to create good jobs for our generation, and to protect the interest of all people, no matter the color of their skin or how much money they have in their pocket. Urge your Senators to co-sponsor the Green New Deal. The Green New Deal lays out a bold vision for getting to zero emissions and 100 percent clean energy — a vision that ensures that everyone benefits from a clean energy economy, including workers and the communities most affected by pollution. Urge your Senators to cosponsor the Deal! Varshini Prakash spoke with Jessica A. Knoblauch, senior staff writer at Earthjustice. Photo of Prakash courtesy of Bora Chung / CC BY-NC-SA 2.0. About the Climate & Energy Program: Earthjustice’s legal victories get the world closer to preventing catastrophic climate change. We use the courts to cut carbon emissions and to force a shift from dirty to clean energy. The time is now to stabilize our climate and build a thriving, sustainable world.